Happy 2019 to you and your family from all of us at the Easton Public Market. 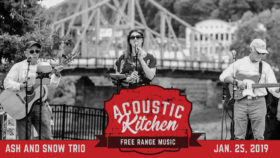 From Chester County, Paul Wilkinson is a perfect blend of folk-rock-pop, a bit of Appalachian with urban appeal. 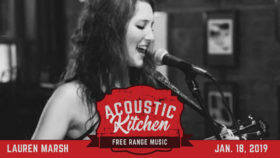 His Americana style is just right for dinner and a beer at the market.! This week’s recipe: Nutella and Banana Stuffed Crescent Rolls. A class favorite – these are delish and so kid friendly but will delight the whole family for breakfast or a snack. 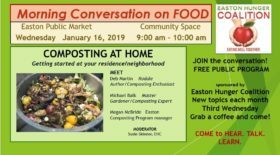 The Easton Hunger Coalition hosts the free public “Morning Conversation on FOOD” series at the Community Room inside the Easton Public Market on the third Wednesday of each month at 9 am. Participants explore such topics as food, local food systems, food justice, food waste, food recovery, and hunger. Conversation moderators will provide information to guide the topic, as well as action items that can be taken to support the reduction of food waste in our community. This month we’ll be talking about how to start your own home composting, a very good thing to do! Winter is a great time to start your home composting planning; you can start up anytime there is a decent stretch in the weather – like now! Even better – form a neighborhood composting co-op and get the job done together! NO FOOD (or any organic matter) SHOULD EVER BE SENT TO LANDFILL WHERE IT CONTRIBUTES SIGNIFICANTLY TO CLIMATE IMPACT! If you are already composting, please come and share your experience! Easton Hospital presents Healthy Living Wednesdays in the EPM Kitchen! Join Nutritionists Alison Unger and Amy Romberger to learn about eating healthy throughout the year as they share tips and recipes on how to promote a healthy lifestyle. 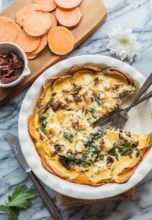 This week: Learn how to make a diabetic friendly quiche with a sweet potato crust. This week’s recipe: Chicken Chinese Egg Rolls. Chinese New Year is not far away and kids will love making these delicious and nutritious egg rolls to celebrate the occasion. Join Alicia Rambo of Easton Yoga and Sarah Hinsch of Greenmouth Table at the Easton Public Market for a healthy and delicious start to your Sunday and the new year! Alicia will guide a one-hour gentle morning flow to wake your body up and Sarah will prepare a nutritious breakfast to enjoy at the end of class. 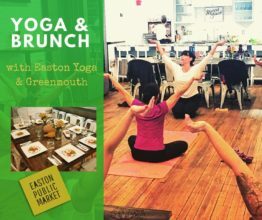 Begin 2019 with a healthy habit — Yoga & Brunch at Easton Public Market! Taste of Asia – SOLD OUT! Join Chef Christopher Bavlinka, owner of The Stone Soup – Allentown, on a culinary tour of Asia that includes dishes of Mainland China, Thailand and Vietnam. 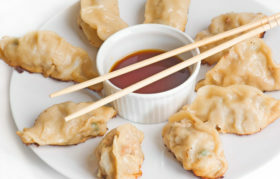 You will learn how to make dumplings, summer rolls, and master basic stir fry techniques. Make your own Asian dishes at home once you complete this class and impress your friends and family with your knowledge of this delicious cuisine. 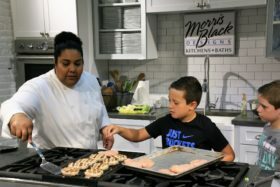 Bring your appetite to enjoy the dishes that will be prepared on your Asian culinary tour in the Easton Public Market Kitchen.